This guide helps you understand the need for a dashcam and how to get one that best fits your requirements. You can install it yourself with our guide or use a third-party installer. Last Update: Mar-2019. What about Tesla’s Dashcam Feature? Accident Recording – If you’re a good driver and get into an accident, it’s more likely the other party caused it. Having a video record of the event can help confirm what happened. Parking lot bumps – Another driver bumps or scratches your car while you are away, and fails to leave a note. Having a video may show the event, the perpetrator and their license plate. Third-party events – crashes or problems you’re not involved in, but would love to have recorded. This might be red-light runners or accidents between other cars in front or behind you. Video log of a trip – Record your travels to show your family, friends or put on YouTube. There are dozens of dashcams available today, but we’ve narrowed the list to a few popular dashcams that are good fits for the Tesla. There are a lot of budget dashcams. We don’t recommend them, as they usually suffer from poor build quality and low visual quality. Lens Adjust Vertical only Vertical only Vertical & Horiz. Each dashcam has several additional features, some unique to a specific brand. You’re unlikely to need or want to use those features in a Tesla, and we didn’t include them here. All three dashcams can be removed from the attached mount, have loop recording modes, have parking modes that only records when the image changes and shock detection to prevent overwrite of that video segment. They all do a good job at recording video in harsh conditions such as direct sun and nighttime. Azdome GS63H – One of the first to offer 4K 24 fps recording (2160p), 150 degrees wide, f1.8 lens, GPS and a 2.4″ LCD screen. Suction mount allows easy attachment/removal, but it not discreet when attached. Cost is $70 without SD card. Released April-2017. BlackVue DR490-2H – The 2 channel model looks similar to the DR650 and upgrades the rear camera to 1080p recording. Cost is $230 with 16 GB SD card. Do not confuse the very similar model name DR490L-2H which is physically quite different, but also offers front and back 1080p resolution. No WiFi in either model. No internal GPS, but external GPS is an option. Announced in July 2017. Note that there are gray market sellers, where BlackVue will not honor the warranty. Buy only from BlackVue or authorized resellers. USA resellers include The Dash Cam Store and HDVD and BlackVue sells direct on Amazon. 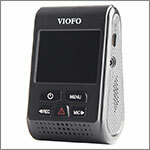 Vantrue R2 – Dashcam has 1296p 30fps recording (2304x1296P), 170 degrees wide angle, f2.0 lens and a large 2.7″ LCD screen. Suction mount allows easy attachment/removal. Cost is about $125 without GPS and without SD card. Optional GPS mount available. Released August-2016. BlackVue dashcams have been very popular with Tesla owners in the past and I own an older model and the newest 900S. On the 650S the low-resolution rear camera is a disappointment and the newer 750S or 900S is preferred. The 900S moves to 4K recording, which we consider well worth it. Note that while BlackVue recommends buying PowerMagic, this is really for ICE cars and is unnecessary and should NOT be used in the Tesla S/X, but may be needed in the 3. Use of PowerMagic may actually stop recordings while parked on the S/X. It offers a full 1080p rear camera and all the key features. The F800 improves the low-light recording. Thinkware has three very similar products, the F770, the newer F800, and the F800 Pro. The F800 has better low-light recording. The F800 non-pro and pro have really minor differences that may not matter to most Tesla owners. This is the bargain of the bunch while offering different features and higher video quality. In side-by-side tests, many places license plates are readable where in 1080p the plates are not readable. The UI is lackluster, but at least it has one – others require the use of an app to change settings. I also own this unit. For the price, it is a good value, but the quirks diminish the shine and could be too annoying for some users. On screen display – can playback video in unit, confirm date/time, recording modes, etc. Here’s two samples comparing a 1080p frame with a 1440p frame. These were taken in the same location at the same time in my Tesla. The dashcams were about 5 inches apart. Next, we look at the car on the far right at full resolution. 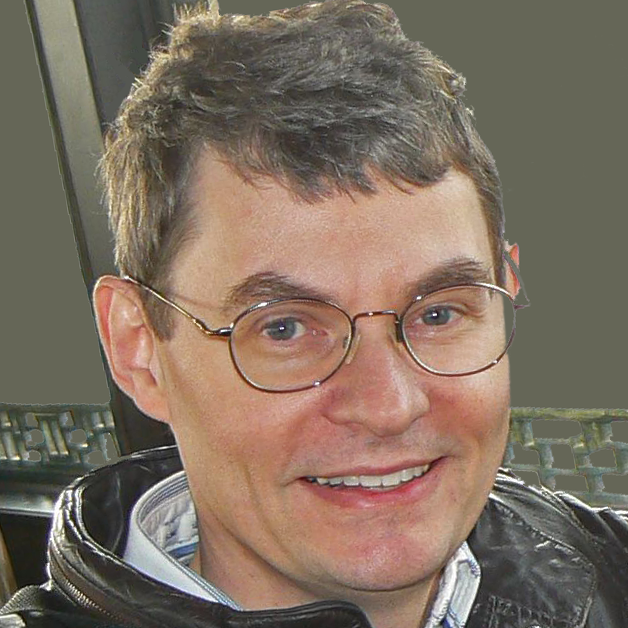 Both are the same portion of the image, only cropped at 344×343 pixels. No image manipulation was done. The portion from 1080p on the left makes it very hard to even tell what brand of car it is and it appears to be a black car. With the portion from the 1440p image on the right, you get enough detail to clearly make out the license plate, that the car is a grey Toyota Camry. If you know license plates, you can also tell it is a California plate. 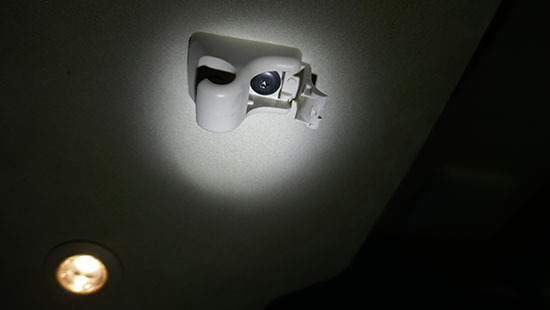 The 1080p image came from a BlackVue DR500GW-HD, while the Viofo A119 was used for the 1440p image. Settings on each device for maximum quality were used, and the frames were extracted from video while the car was in motion. Latest firmware in each as of Jan-2017 was used. We didn’t cherry pick these images – we compared multiple frames in different situations and saw similar results. We really wish more vendors would boost the video quality as it makes a huge difference. We created a new resolution test with the BlackVue DR900S-2CH and the Viofo A110 in June 2018 in my Tesla. For this test we used the latest firmware for both, and used the highest quality options – 2160p extreme for the front DR900, 1440p for the Viofo, and 1080p using the DR900’s rear unit pointed forward. All three camera lens were within 3 inches of each other, running at the same time. You can click on the image above to see a larger view (but 50% of actual size due to how large the image is). We did brighten the A119 image slightly to give all three images a similar brightness, but otherwise did no other modifications. We also carefully picked the images from each camera to be matched within one video frame time-wise. The colors in the DR900 appear a bit more natural to us. The clarity of the A119 1440p image is very close to the DR900 2160p front camera, but the DR900 is capturing a wider view requiring more pixels. The manufacturer’s specs claim they cover the same wide angle, which does not appear to be true. We get some vehicle glare, which is typical of all dashcams. We normally use a polarizing filter to reduce glare, but removed them for these tests. See below for more about polarizing filters. This last set of images were taken while the car was moving at 25 mph. In other tests, even at 70 mph, the dashcam pictures hold up quite well. Ok, did you identify the silver car as a new Model 3 without a license plate? The prime need is a front camera and covers much of what you’ll want to record. A rear camera is a bonus and give you far more coverage. Many owners are opting for dual camera solution today. A few owners go all the way and install 4 cameras, getting full 360-degree coverage. For example, using two BlackVue 650S-2CH cameras, you would mount one primary at the front, and its rear camera on one side. Mount the 2nd BlackVue on the rear to get full 1080p rear coverage, and use its second camera on the other side. The lower resolution side cameras would be mounted in the front door’s small triangle window area. Tesla provides some basic dashcam like abilities for vehicles with HW2.5 or later (vehicles built after July 31, 2017) with Tesla software version 9. Older vehicles do not get the dashcam feature, due to hardware limitations. Only one forward camera is used for recording at 1280 x 960, fairly low resolution when compared with today’s most dashcam alternatives. At this resolution a license plate can only be read when the car in front is about 10 feet or less in front of you. Tesla also uses the odd frame rate of 36 fps. This makes it somewhat jittery when viewed on most video devices that require conversion to 30 or 60 fps. Most third party dashcams start at 1920×1080 at 60 fps (1080p). Looking at the Tesla dashcam video, the colors seem quite muted and the brightness jumps around a bit. Recording is done to your own FAT32 USB flash drive, up to 1 hour in 1 minute segments while driving. An option is available to save the last 10 minutes by touching the dashcam icon on the display. It does not have a parking recording mode as the AP hardware would have to remain powered up, costing about 2 miles of range per hour. Elon has said improvements to the Tesla dashcam are in the works, such as recording video while parked and the car gets bumped. No timeline for this or other improvements has been stated. Ideally, you want it out of sight with the camera up high and centered on the windshield. For pre-AP cars and all cars with a very wide angle dashcam like the DR900S, a good location is below the rearview mirror housing. On AP cars another option is to place the dashcam on the right side of the housing up higher, if the mirror mounting doesn’t obscure part of the image. The right side may also be a better place so the dashcam gets the best signal for GPS. This location should have a ‘clear’ area that does not have the metallic IR shield and it may help to be near the glass edge. I’ve tested the GPS both on the right and also below the AP2 housing and GPS works fine. Another consideration is if buttons are in reach or if that is even important to you. Rarely will you need to press buttons while driving. During installation, be sure the lens is not obstructed by the black area of the windshield or the mirrors/AP housing. Confirm the lens is in the area cleared by the wipers. Confirm the unit and power connector will not bump into the headliner or mirror housing. Leave room to make the unit removable too, which varies by dashcam selected. Position the dashcam at the top of the hatch glass, so the dashcam lens is centered in the hatch. Ideally, you want the view to not be obstructed by a defroster line, but that may be difficult. If you ever expect to remove the rear mount, you may want to avoid placing any adhesive on the defroster line. When removing the mount, it will likely damage the defroster wire. You really want to keep your dashcam powered on all the time. The power use is minuscule in comparison with the battery capacity and you’ll be able to record events while parked and you’re away from your vehicle. Keeping the power on is a problem on ICE cars, and various solutions designed for ICE cars works poorly on the Tesla S/X. For example, the BlackVue recommends using the PowerMagic add-on. Do not use it in the S or X, but it may be necessary in the 3. In the case of the Thinkware F770/F800, the 3 wire hardwire kit must be used to get around the power sensing limitation of its design. For the A119, we’ve selected a hardware kit that works great in the Tesla. Be aware some other kits will power down when the 12v battery is low. Trust me, you do not want this to happen! The Tesla 12v battery may appear “low” to a dashcam multiple times each day even while driving as the Tesla 12v battery is recharged automatically as needed from the main battery. We’ve seen a number of reports that the Model 3 12V battery system does not play well with a dashcam that remains on while parked. It may show a 12V fault message and/or the 12V battery may need to be replaced. One solution if you wish to maintain recording while parked in the Model 3 – BlackVue has a second battery backup option called PowerMagic Ultra ($299) . Owners who have used this have reported no problems. Be aware it turns off the dashcam when this auxiliary battery gets too low. It should run the dashcam for about 24 hours when parked. All dashcams come with a 12v cigarette lighter type power adapter. We recommend you try out your new dashcam before mounting using this connection. Get the hang of how the dashcam works and verify the video produced looks fine. Try out your planned mounting location before actually attaching it to ensure there are no visual obstructions. Since Tesla’s 12v power plug turns off when the car is off, it is a poor choice for day-to-day use. Before you begin, clean the windshield in the area you plan to install the dashcam. I’d even perform a quick test to confirm your planned location does not have any viewing obstructions. The dashcams have a very wide angle, and some positions may have visual obstructions. For example, the A119 fits very well up high, about 1″ away from the passenger’s side of the AP/mirror housing, while the BlackVue may be better placed below the AP/mirror housing with the lens on the vehicle’s centerline. Don’t block the light sensor on the back of the mirror, on the driver’s side. On a pre-AP car, you may prefer to be up on the passenger side of the mirror mount. On the BlackVue it has “PITTASOFT” in white letters on the bottom of the mount facing outside. We’d rather go more incognito so we used a black Sharpie pen to black out this logo before mounting. It may depend on the tools you have available, but we used a fish tape, a screwdriver with a T15 bit, a small flat screwdriver, a black sharpie pen, scissors and several feet of string. Wire strippers and diagonals are useful for the wiring. 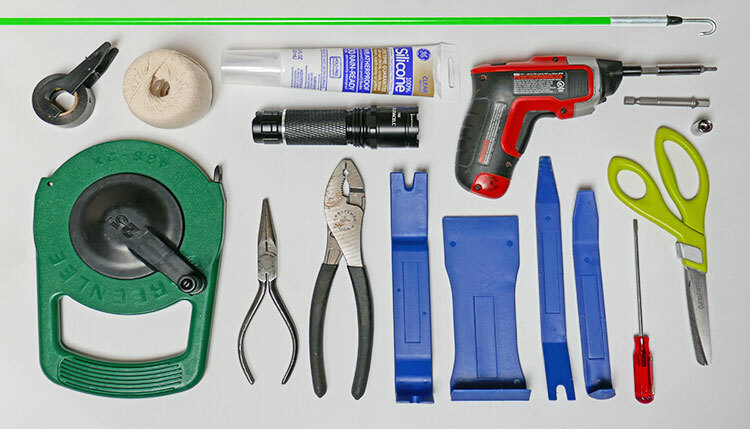 A soldering iron and solder may be required depending on which power method you choose. Most Model S cars include an always on power source in the headliner, behind the microphone panel. To open this panel, pull down using your fingers, at the back edge. Two snaps will release and it will hinge down. There should be a 4-pin, 3-wire connector taped to the panel, or in Europe, cars with the pano roof option may be connected to the intrusion module (part of the EU security package). During a small period in late 2013 to early 2014 some owners were unable to find the connector and it may be missing or tapped up in the wire bundle.. If missing, you’ll need to route the wires to another point, such as the ODB II connector in the driver’s footwell. Pin 1: 12v, wire color: Red/Dark Blue (older cars and AP2 cars), Tan/Black (after Oct-2014, before AP2). We’ve also heard one unidentified car had a gray wire! You DO NOT want to install or use PowerMagic (BlackVue) on the S or X. It will only cause problems, but may be needed in the 3. There are two microphones with 3 wires each. Do not connect to either of these, as there is no power on these connections. If you have the 4-pin intrusion module connector, this is the best source for always-on power. 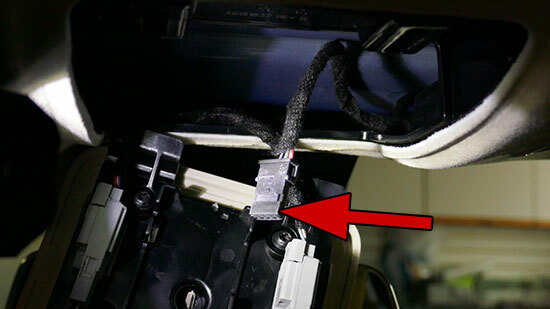 All cars made after September 16, 2015 have this connector, as do most 2012-2013 cars. For a BlackVue installation You’ll need the BlackVue Hard Wiring Power Cable. It may have been included with your package, but it not, you’ll need to get one. We made a dashcam cable project that provides power without any cuts or modifications to your car using the same connectors as Tesla uses. It also works if you have the intrusion module or plan to buy one in the future. For our BlackVue DR900S installation, we cut the long two-wire cable to about 18″ and reattached the fuse. If using our dashcam cable project, just insert the dashcam power to the T connector and clamp shut. If using the fan connector, solder the wires. Other dashcams should have similar cables and can be attached to power the same way. If using the fan connector, the wire colors do not match up as you might expect. Pin 1, blue, connects to the fuse. Pin 3, red, connects to the BlackVue black wire. The other end of the fuse connects to the BlackVue red wire. We used some heat shrink tubing to protect the connections. You can tap into the wires with 20-24 gauge red Posi-Taps. You can use a Male header strip. Cut off 3-pins of the strip and solder the red wire to pin 1 and ground to pin 3 (pin 2 is unused). Use heat shrink tubing to prevent shorts and clearly mark pin 1. I used a silver marker, but better to use red shrink wrap on the +12v lead. On my header, I pulled out the header center pin 2, which made it easy to tie wrap the header to the Tesla connector (to avoid coming apart under vibration). You can buy the mating connector – TE part 3-968696-2 along with two crimp pins 1-928918-1 (sold in strip of 100). For the Thinkware F770/F800, you need to buy the 3-wire hardwire kit. The red and black power leads can be connected to power as shown above. The ACC yellow wire must be connected to a switched power source, so the parking mode works. While we didn’t install this dashcam, others have found the Tesla rear view mirror uses switched power and you may want to tap into this connection. The mirror switched power wire color has changed over time. For older cars, you need to Yellow/Dark Green wire. For cars built after Oct-2014, the wire color is just Yellow. We have not confirmed the color in AP2 cars, likely still Yellow. The mirror cable may be accessible from the microphone opening on pre-AP cars. It’s a separate bundle of wires, wrapped in black. 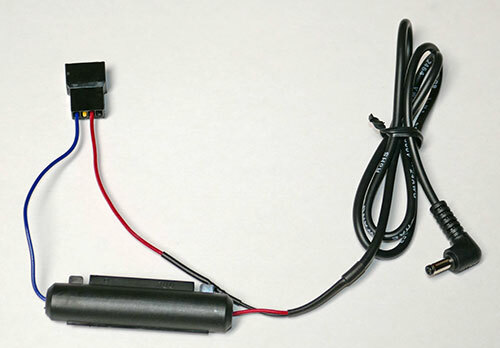 With AP1 or AP2, you may need to disassemble the camera housing and locate the rear-view mirror connector and tap into the correct wire using a Posi-Tap. We recommend you first confirm it is a switched 12v power wire with a voltmeter. Otherwise, you may need to pull out part of the headliner (quite difficult) to access the bundle of wires with the switched power. Model 3 uses an electronic fuse system, that if tapped into the wrong place, your dashcam will generate errors and problems! Tesla was nice enough to provide a seperate 10 amp circuit that is electronically fused for 15 amps. It is not used for anything else, but it is switched power – meaning the power turns off when the car turns off. Use Video1 and Video 2 from Ingineerix to help connect to this power source in the cabin at the left footwell module. Here’s how we installed a BlackVue DR900S front camera in our Model S in less than 4 minutes (ok, we made a few edits to cut out long pauses). We want to remove the small visor receiver to make running the wire through the headliner easier. First push the visor to the side. Using a small screwdriver, pop the plastic tab on the visor receiver. Be aware it is hard to snap open. Using a torx T15 bit, unscrew the screw and remove the receiver. Use a plastic pry tool to temporarily open a small gap between the windshield and the headliner near where you want power wire to exit the headliner. Leave the pry tool in place to keep a 1/8” opening or so. I picked a spot about 5” from the AP/rear view mirror housing. From the microphone housing opening, feed Fish Tape over and down through the location of the pry tool. I connected a 3-foot string to the fish tape. Pull back the fish tape so the string is now hanging out both sides. Remove the string from the fish tape. At the microphone panel opening side, we tied the string to the power connector side of the dashcam power cable and pulled the string from the windshield side to get the cable through the headliner. Adjust the length and position of the cable to connect to the dashcam without a lot of slack. Remove the pry tool. If you are unable to get always-on power in the headliner area, you can run the wires across the header and down driver’s or passenger’s A pillar. IMPORTANT: Do not push the wire into the side of the pillar! It houses part of the side curtain airbag. 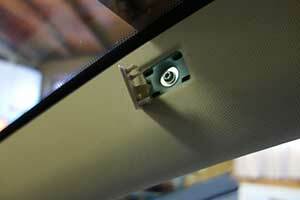 On the Model S, remove the pillar by first removing the small rectangular plastic tab that hides a screw. Remove the T25 screw and snap out the pillar cover from the top. The bottom may be tightly secured and has the connection to the tweeter. You can work with it still attached at the bottom and save some aggravation. You’ll see a track in the pillar that is designed to feed a wire without interfering with the airbag. Be sure to use this channel. The black side panel of the dash is held on with three snaps. Just pull towards the door to remove, and disconnect the FOB bar antenna. The lower under-dash panel is held with one screw and snaps downward. Be careful not to pull or damage the knee airbag behind the panel. Feed the wire down to the ODB II port. You can use a ODB II port connector to get always-on power without having to tap into any Tesla wires. If you use a bare ODB connector, pin 16 is 12v, and pins 4 and 5 are ground. A dual dashcam requires a wire that is routed between the cameras. 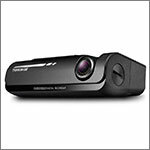 Single cameras, such as using the A119 or any other single channel dashcam for the rear only require power, although you can run power from the front dashcam area to the rear. Most of our installation advice is for a Model S (all roof types), and portions will apply to a Model X. The Model 3 has a unique problem of where to mount the rear camera with a all glass roof. 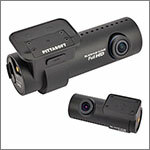 Our example installation is for the BlackVue DR900S-2CH, but is very applicable to other dual dashcams. We expect once you have the parts and tools at hand, the installation should take less than 2 hours, and perhaps under an hour if you are very skilled. That said, it took us about 4 days, with camera setups, trying out different ways that might work, and reshooting segments that were not clear or needed a better angle. You will absolutely need a Fish Tape. You’ll also need a 7mm socket wrench, a T25 screwdriver or bit to remove some screws, Pry tools, and other assorted items. We also used some string, electrical tape, and clear silicone sealant. IMPORTANT: When routing wire to the rear dashcam, it it very important to do it in a way that does not interfere with the side curtain airbag deployment. In addition, you don’t want to accidentally puncture the airbag while routing the wire! We found a good way to route the rear dashcam wire is along the headliner, around the A pillar, along the right side front door rubber seal, around the B pillar, along the right side rear door rubber seal, down around the rear cabin corner cover, through the liftgate rubber harness grommet, and through the liftgate. Wire route between rear and front cameras. For the Model S, you will need about 19.5 feet (6 m) of cable. The BlackVue includes this length of cable. For our installation we had less than 2 inches to spare! This is partly because of careful routing to avoid the side curtain airbag and complex routing within the liftgate. As an alternative (or on the Model X), you can go down the A pillar and go along the sills. This approach will take more wire, often more than is included with the dashcam. You would be wise to buy a longer cable for your dashcam if you choose running along the sills such as a 10, 15 or 20 m BlackVue cable. We also explored some shortcuts, but each had problems or complexities, and we didn’t want to drill holes or risk interference with the curtain airbag operation. Do not route on the left side of the car (even on RHD vehicles). On the liftgate, there is a left and right rubber harness grommets. The one on the left is packed tightly with antenna wires and it will be difficult if not impossible to add your dashcam wire. The right side has a group of somewhat thinner wires, that allows for the dashcam wire and connector to be pulled through. On current generation of cameras, we don’t recommend cutting and patching the cable. Beyond power, it supplies two-way data at very high speeds. While a splice may work, it could degrade the signal to a point where video becomes unreliable. When attaching the rear dashcam, avoid placement where the adhesive is on a defroster wire. We don’t think the heat will release the adhesive (but who knows?). Our concern is if you ever remove the dashcam mount, it may rip off a portion of the defrost wire. You’ll see in the video we installed a cable cover to better hide the two wires that go to the front dashcam. This is not really necessary, but make for a more professional looking installation. Some owners have routed the wires through the AP camera housing, but we’re reluctant to do this, as there might be a small chance of knocking the AP camera out of calibration and it may require cutting exit points for the wires. Here’s a step-by-step actual rear camera installation in less than 18 minutes, although we trimmed some of the longer parts! If the rear dashcam is stand-alone, you only need power, and the installation becomes easier. While the power could be routed to the ODB II port near the driver’s footwell, there is a closer spot if your car has the power liftgate. In this case, you connect to the always-on power lead on the Hatch Control Module. To get to the module, it is located on the passenger side, behind the trunk’s right side panel. There are two connectors going to the Hatch Control module, a 20-pin and a 10-pin. You’ll tap into the 10-pin connector. You can use two 16-18 gauge blue Posi-Taps to make these connections. 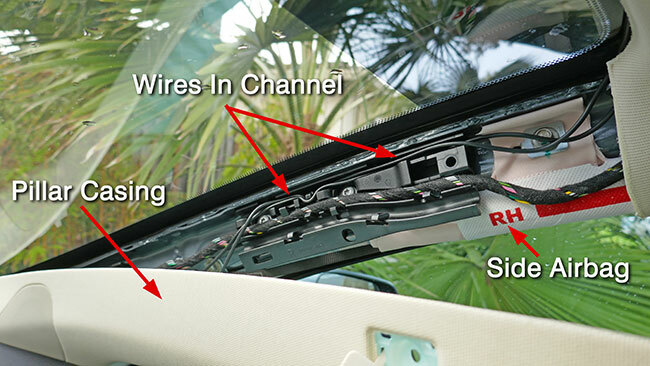 Use the last portion of the installation video above to route the wires into the liftgate. When you first apply power to any dashcam, it often takes 10-30 seconds to boot up and come on line. The delay is not important in normal operation, as it remains on all the time. To remove the SD card, first remove dashcam power. Wait 5-10 seconds until you see it power down. There is a backup capacitor to allow time to stop recording and properly stop writing to the SD card. Once powered down, you can remove the SD card. When removing the micro SD card, press in to release. Keep a finger close behind it as it is spring loaded and can pop out and easily get lost! You must either install the BlackVue to your phone or tablet, or install an app to your PC (Windows or Mac). You should also download and install the latest dashcam firmware. Full instructions for BlackVue’s apps or installer here. For a PC, you must also decide if you want to use BlackVue’s innovative cloud service or move the SC card between the dashcam and your PC. Use the BlackVue on a phone or tablet and connect via WiFi to the dashcam. Download the Android app from GooglePlay or iOS app from the Apple App Store. Wait for the camera to announce “Upgrade is now complete, continuous recording will now start.” Thinkware recommends not turning off the dashcam power until it begins continuous recording as it can cause permanent damage to the dash cam. On the same downloads page, you can get the PC Viewer for both Windows and a Mac. After downloading, run the downloaded file to being the installation. You use this app with the SC card temporally removed from the dashcam. Alternatively, you can use the Thinkware Dash Cam Mobile Viewer on a phone or tablet and connect via WiFi to the dashcam. Download the Android app from GooglePlay or iOS app from the Apple App Store. Either method allows you to change various settings in the dashcam to suit your needs, and view videos. Format the SD card by camera or on computer as FAT32 (note Windows cannot format FAT32 greater than 32 GB – use an alternative utility or format within the dashcam). Insert card in camera and connect it to your PC using USB cable. Copy only the LDBA119.bin on the root of the SD card. After LDBA119.bin is copied to the SD card disconnect the dashcam from your computer. Reconnect the dashcam to your computer and wait few seconds until you see Mass Storage on the LCD screen. Delete the LDBA119.bin file from the SD card using your PC and copy the FWBA119.bin file to the root of the SD card. Disconnect the dashcam from your computer. Reconnect the dashcam to your computer and wait until you see Mass Storage, the front LED blinks while the upgrade is in progress. After upgrade completes successfully, the FWBA119.bin file is automatically deleted by the dashcam. Now you can disconnect the camera from PC and connect it to the vehicle’s power connection or if you want to experiment with it, power it from any AC to USB adapter (i.e. not the PC). To change settings, if the Rec button is red (i.e. recording) press it once to stop recording – it takes a second, but should switch to flashing. Then press Menu. Ignore the bottom line of the display- the choices do not relate to button positions! Use the < Rec and Mic > buttons to scroll through the setting choices and the center Warning button to view or change a setting. When viewing a setting, the < Rec and Mic > buttons shift through the choices for that setting. To save a setting press the center Warning button. To exit without saving press the Menu button. One simple enhancement is the installation of a circular polarizing filter (CPF) for your dashcam. This greatly reduces glare from windows and other cars. These are snap on filters, so are easy to add. The filter will reduce the brightness slightly, so you may want to increase the exposure a few stops in the settings. BlackVue – A third party offers a Polarizing Filter available for the front dashcam for $30 that works with the 650S, 750S and 900S. Most dashcams use a micro SD card to record the video. Since video is continuously recorded to the SD card, it’s important to get a high-quality card designed for continuous HD video recording. A card rated for Class 10 is a minimum speed threshold and UHS-I is even better (and required for 4K video). You may also want to get a card with high capacity, 64 to 128 GB to increase the storage time before video is overwritten. Be aware there are a lot of fake and damaged SD cards sold on-line. If the price is too good to be true, it’s a fake drive. Scammers have figured out how to remark a cheap slow drive as a larger capacity and override internal values to make it look like a larger drive. For example, a 2 GB drive is sold as fake 64 GB drive. It will appear as 64 GB from your PC/Mac, even if you reformat it. After writing more than the real capacity, the data is either lost or overwrites earlier data, but no errors occur. When attempting to read the data, most of it will be corrupted. To avoid a fake drive, buy only a name brand and buy from retail or a trusted online retailer like Amazon, BestBuy or Newegg. Avoid opened packages and auction sites like eBay as most drives are fakes. The scammer hopes you’ll not discover the drive is crap until the return period expires. There are two types of flash memory – low cost TLC, that can be overwritten about 500 times before failure, and the more expensive, but more durable MLC, which are at least 3 times as durable and can be overwritten about 1500 to 3000 times. MLC cards usually have better error correction and wear leveling to further increase the lifespan. The larger the drive, the longer it will last, as the data is not overwritten as frequently. All of these drives are suitable for HD Dashcams. High resolution 4K recording requires 25 MB/s write speed, and dual camera dashcams, like the BlackVue DR900S-2CH, requires 35 MB/s write speed in the highest quality mode. Note that Lexar brand was discontinued, so we’re not recommending them anymore. SanDisk, other than High Endurance, is not recommended for BlackVue due to reported boot problems on some models. Thank you very much for your site and detailed explanations and videos! I was able to follow your guide and installed a blackvue 900 about 6 months ago using the 4 pin fan connector. About 3 months in the camera would power down intermittently. I assumed it was a loose or faulty fan connector so ordered a new one and replaced it. It worked for a few more months and would power down but if I wiggled the connector it would turn back on and stay on; last week it stopped working entirely. I was very happy to come back to your site and see you had a kit for sale to assemble a great connector. I just received it today and assembled it (excellent instructions!). I plugged it in and dashcam won’t power up. The camera powers up with the cigarette lighter adapter so ruled out a faulty camera. I suspect it may be an issue with the Tesla power source. Here’s the noob question – how can I check that the connector in the car has power? Thanks again! Thanks getting the dashcam kit. Sorry for the problems. Ok, if you have a meter, you can check power at the black Tesla connector. The outer two pins of the three should have 12 volts (may be closer to 14.5 volts, which is expected). If no voltage, the Tesla 5 amp ODB/Security fuse may have blown. 1) The inline fuse to the dashcam is fine? 2) Check that the wires are in the right locations. Use the photo: https://teslatap.com/wp-content/uploads/2019/01/Teslatap-dashcam-power-cable-connected.jpg and verify the black and red wires in the blue connector matches up with the black and red wires in the Tesla black connector. Next check the T connector that the red/back wires are correct (if the T connector was flipped, they would be backwards). I hope that helps solve it. Blown 5A fuse F100! It was fun to track down and even more fun to get to it. Also found disconnected hoses for what looks to be a drip pan that I was able to reattach hahaha. Thanks again for your help and for all of the valuable information, time and knowledge you freely share with all of us! I have a European Model S from August 2018 with the intrusion module. I discovered that the StarTech.com FAN4EXT12 cannot be used as a very clean way to not have to tap into the existing wiring as the connector cannot be plugged into the intrusion module. I could tap into the 14V and GND leads but I don’t really like that approach.I’m now considering either to solder onto the connector pins as it seems the connector can be folded open or to have a lead go to the fuse box. Does the Model S have an internal fuse box somewhere? There is a fuse box on the left side in the driver’s footwell, behind the black plastic cover (for LHD cars, not sure about RHD cars in England). Many of the fuses are unpowered when the car is off, so you’ll need to find one that is always powered on. Sorry I can’t be of more detailed help. I’m actually working on a new connector that fits between the power to the intrusion module and the connector (i.e. no cuts or splices). It will be several weeks before I get all the parts as I may make a tiny PCB for part of the project and sell a completed assembly or a kit of parts. It could be 4 weeks before it’s ready, so the timing may not be great for you. Thanks for the incredible installation post! Do you know of a source to purchase a wire cover V1 for the BlackVue installation? I don’t have access to a 3D printer. Sorry, I don’t know of anyone making them for sale. You might consider 3dhubs. They take a STL file and offer it to a range of people who have printers, and then send quotes back to you. I used the service a few years ago, and I thought the prices were reasonable and had quick turn around. Note the settings and material in the guide above, which you’ll want to include in your quote. Also include you want it in black. I read every step of your installation guide and notice you took the path above the doors and pillars past the air bags to install the wire for the rear camera. I have a 2017 S with panoramic sunroof. It has a crevice along the edge that can possibly provide an alternate path from the front to the rear of the car. Do you see any problem with that solution? I’m not sure of the routing you’re considering, but it is really important to avoid interfering with the side curtain airbag deployment. When this airbag deploys, it pushes out the headliner and spreads downward. The airbag works the same on all roof versions – metal, glass and pano. It’s extra work to use the layout I suggest, but it avoids risk of the dashcam rear wire stopping the airbag from deploying. I don’t think the airbag is strong enough to cut through the wire. Another approach is to route under the floor sills, but it looks like it takes an extra 8 feet of cable or so. Thanks. I found this You Tube video that better illustrates my point. At 9:39 minutes into the video it shows the path I’m describing. Thanks for the visual. That approach looks safe to me as you’re above the airbag. I’ve seen a lot of videos where they route it in the seam of the side pillar (down several inches from the roof) which is not good. The approach from an open sunroof looks a lot easier too! I completed my dash cam installation this week. I have to congratulate you on your agility with getting the grommet out between the body and trunk lid. Maybe because of the freezing cold I was unable to accomplish that step. So the alternative was to have a loop of exposed wire go between the ceiling of the car’s last trim panel to the liftgate center panel. I can get away with it aesthetically because I have a black car and the wire is also black. Maybe I’ll tackle rerouting into the grommet in the summer. I have read your Ultimate 2018 Tesla Dashcam on your site. I am having a problem. I purchased my 2015 Model S in September 2015.
ame to my house to change the battery. – I do not know if the Power Magic add on was installed. So what I have done is unplugged both dashcams and will plug it it when it’s in use. Tomorrow, Tesla will replace the battery. This weekend I will travel to the installer to see if the Power Magic was installed, if so, it need to be uninstalled. I will share your recommendations about NOT have the Power Magic installed. If that is the reason, can you tell me why it does not need to be installed? Am I right about unplugging it as well? The dashcam takes a trivial amount of power, about 300 mA. The main battery automatically charges the 12v battery when needed. If nothing else required power, the Dashcam should easily remain powered for a year or more if the car started out with a full charge! The reason to avoid PowerMagic is the car is draining and recharging the 12v battery 3-5 times a day. When the 12v battery gets low, PowerMagic turns off the dashcam. This means you loose recording when parked – a valuable feature of dashcams. PowerMagic doesn’t know the main battery is used to recharge the 12v battery in an EV. In an ICE car, the dashcam would drain the 12v battery in a few days and the car can’t be started. So PowerMagic is needed in an ICE car – but not an EV. Anyway, there is no need to unplug it, even with the 12v warning. It will not help/hurt, but the warning does indicate the 12v battery is reaching the end of life and needs to be replaced in the next few weeks. – where did the fuse holder come from for the BlackVue 900- 2ch? I just receive mine and it has no fuse. – the front camera installation video is unavailable? Thanks for the YouTube link, that worked for me. I’ve gotten the front camera installed. I didn’t add a fuse, I figured that if BlackVue is no longer providing one it may not really be needed; I hope I don’t one day regret the decision. One discrepancy is that the screw holding the A pillar cover in my May 2018 Model S is not a Torx, it’s a standard 5/16″ hex head tapping screw; no big deal. So far so good with the rear camera install. Getting the covers off the B pillar was a rough. I’ve gotten the cable to the C pillar, tomorrow I’l do the routing through the hatch. One concern is that before I started routing the cable I plugged the rear camera into the front one and got a message on the phone app to check that the rear camera was connected. It was connected. Maybe I’ve got something wrong in my settings. I hope it’s that simple. Thanks so much for your web site and the great information you’ve posted here. I couldn’t have done this installation without your help. The car also has a fuse (15 amp) so it’s not supercritical if you went without an additional one. It’s more to protect the car than the dashcam. That said, I’ve never blown a fuse (in-car or accessory) in 30+ years of adding numerous accessories to cars over the years. Be aware if the car’s fuse does blow, the alarm system will be offline as it’s on the same circuit. Yep, releasing all those snaps on the B pillar cover is hard! Glad you’re going the extra mile to do it right. So many just stuff it in the B-pillar seam where it’s going to hang up the curtain airbag. I’d suggest having the power off on the front dashcam when connecting up the rear camera, then power up both together. Unlikely to harm anything if your sequence is difference, but the rear camera might only be detected during the front camera power-up. Things are getting complicated. I’ve been unable to get the rear camera recognized. Worse, after about a week of operation the front camera no longer functions. I checked the voltage at the connection behind the microphone panel and the reading was – 3.25 volts. I’m wondering if the low voltage is what caused the rear camera to not be recognized, and if it also caused the front camera to fail after a week of operation? Or maybe it’s the other way around – whatever was wrong with the BlackVue camera setup has damaged the circuit in the car to cause the voltage to be about 1/4 of what it should be? Your thoughts on this? Thanks for any suggestions you may have. Any chance you’re connected to the center (pin 2) of the 4 pin connector? This is a LIN bus and does not have 12v of power. You should be connected to the outside two wires (details in the write up above). You might also check the voltages between each of the 3 wires, just in case the wires were inserted into the connector wrong at the factory (although I’ve never heard of this happening). One will be ground, one should have 12v, and the one not to use will have 3 volts or so (it’s actually a data line, not a voltage source). If this wiring is right, then my next guess is the fuse for the circuit is blown. If blown, the alarm circuit will be dead. A quick test is to roll a front window down, close and lock the car from outside and keep the fob away from the car. Reach in and open the door from the inside handle. The alarm should go off – which means the fuse should be good. Use the fob to disable the alarm if it goes off. Another test for both front/rear dashcam is to attach the cigarette lighter cord that came with the dashcam to the 12v. If this works, it at least ensures the cameras are working and the power source is the problem. Turns out I was giving incomplete information, wish I could think faster and sooner. I got the 3.25 volt reading with the camera is plugged. Today I unplugged the camera and the reading is 12 volts when the circuit is open. Plug the camera back in and the reading dropped to 3.0 volts. I will reconnect the cigarette lighter core that I cut off and try that, I will also test the alarm. Thanks for putting up with my posts, after the problem is solved hopefully they will at least be helpful to others who run into trouble. Thanks for the additional details. As you know, something is wrong if you’re getting 3 volts when connected. I’d expect it to blow the fuse if it dragged the 12v down to 3v. It sounds like a bad connection or perhaps the wire is not crimped properly in the Tesla connector (Tesla’s side not yours) and it can’t provide even a little current that the Dashcam requires. The 12v power port test should at least identify if the Dashcam is working or not. Success. The vendor replaced both front and rear cameras since we couldn’t be sure which was the problem, but I believe it must have been the front one. Finished routing the coax cable through the hatch, turned out to be easier than I feared it would be. Your video was a life saver, never would have figured out how to do that otherwise and probably would have just run the cable exposed from the C pillar to the rear camera as other installation videos show it. Did have a bit of trouble avoiding the airbag at the C pillar, a bit more guidance at that location might be helpful to others – only after I’d already run the cable through the rubber tubing between the body and the hatch did I understand what I should have done back at the C pillar. Mine was a grey 12V wire as well. I would suggest that you film more on the C pillar as that confused me a little. I didn’t use fish tape, however I used CAT6 cable – took a while though! On my Model S refresh mid-2016 AP1 model, routing the rear cable was difficult as there was lots of foam located in the cavities. Nice video though, thanks for spending the time to make it, much appreciated! You are right, there was 1-2 inches left for the rear camera!! Does anyone have a recommended installer in the SE of England (Cambridge area). I could do the Topfit install myself but the quality of image looks pretty poor. More complex hardwiring is beyond me. I am considering a 4ch installation with cameras mounted on the front door triangle area. How do I run the wires to this area? Do I remove the interior door panels? Is there a grommet for me to run the wires from the front of the car to the interior of the door? 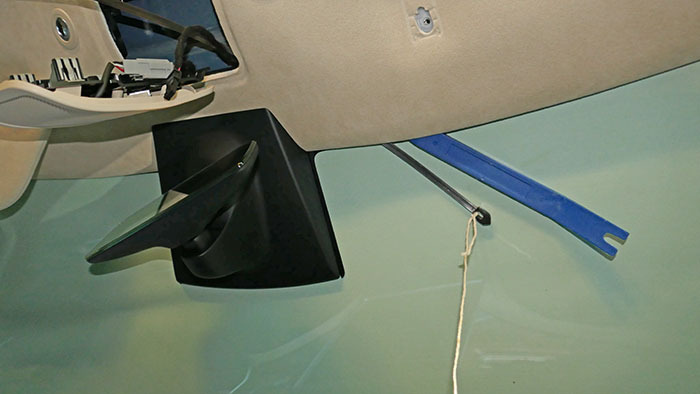 While I’ve not done a 4ch installation, you can remove the door panel (see this project, which has the step-by-step door panel removal: https://teslatap.com/modifications/projector-logo-lights/). I expect routing the wires through the flex door cable cover will be the most difficult part. Both sides are not easy to get to and there is not a lot of free space to run another cable. You may need to remove the connector so the wire is thinner and use wire lube. I have had a BlackVue for a few months, and it’s time to hard wire. However I only get 10v off the intrusion module connector. I found the connector taped to the back of the mic plate as expected but the wiring into the connector is different than described. I have 3 wires: Grey, Green/Red, Black. Green/Red is + and Black is ground. Grey seems to do nothing. Any suggestions? Very odd – The Grey wire should have 12v (actually closer to 14v). The Green/Red is the LIN data bus and shouldn’t be used. If the Grey wire is dead, I wonder if the fuse for the alarm is missing or open. Roll down a window, close the car and lock it with the FOB. Then open the door by reaching in and pulling the inside handle. The Alarm should go off. If it doesn’t, there is something wrong with the alarm circuit (likely the fuse), which is the same power as connected to the grey wire in the connector. You can try and fix it yourself, but if you’re near Tesla service, they should fix it under warranty (i.e. the alarm doesn’t work). I’m fairly confident that once the alarm works, you’ll have power. Now if the alarm does work, and there is no power on the grey wire, it may be a disconnected or cut wire somewhere in the wiring harness (very hard to find). I’d at least try and tap into the grey wire before it goes into the connector (or probe it with a needle) as perhaps the connector crimp is bad. Let us know what you find out and good luck! Hi! I purchased 2 Spytec A119 and was trying to install them on my X90D. I was planning to use the OBD-II port for constant 12V power, but it seems there’s no power on the port in my car. I found on another forum that some TMX owners had the same issue, seems it comes from a 5V fuse located close to the driver’s right foot. I was searching for support around me in France before stretching to try to reach the fuse, and thant’s when someone indicated that the OBD-II port is disconnected when the car is closed… do you confirm that ? Is it worth trying to replace the fuse for the OBD port or should I go another way for constant 12V ? Thanks for your help ! In the past the ODB port has constant power on Teslas, so I suspect the fuse may be the issue. You may find another 12v source in the fuse panel, but you’ll need to confirm any choice is always on power. On the MS there have been open slots where you can insert a fuse and get power. Not elegant but a clean way to go. 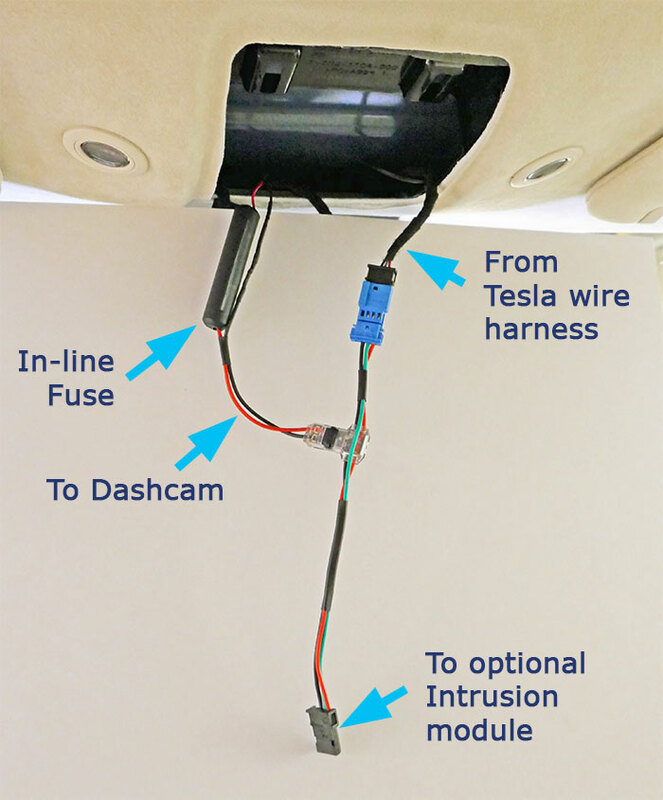 This older Dashcam article shows one way to do this (on the S): https://teslatap.com/modifications/dash-cam/ Sorry, but I don’t have a fuse map for the X, or I’d make a couple of suggestions as to what fuse to use. Thanks for your answer, I’ll check the OBD fuse & keep you posted ! oh… before I go and put the fingers in the fuse box, how about this other way ? Unlike the other dashcams, the A119 runs on 5V power & 400mA current (I guess that’s with the display on, so maybe even less with the screen saver ?). 2 dashcams running during 24hrs would use just a bit less than 20,000 mAh. 2 advantages : 1) easy to install and hide under the phone dock, and 2) it would avoid drawing current from the 12V battery while the car is parked. I’d be happy to read your thoughts before proceeding… thanks ! That’s a clever solution. I don’t see any problems with it. Note that I have zero concerns about drawing power from the car’s 12v system while parked. If there was no other loads on the batteries, it would last more than 2 years on a full charge. You’d go along the headliner, down one of the side pillars (see installation notes in the article above), then under the dash and/or under the carpet. If you have a console, you can pull off a side panel partly and thread a wire through the hole in the back of the console. See our Tshow project for more details on routnig a wire through the back of the console: https://teslatap.com/modifications/tshow-part-8-installation/. It’s a bit of a pain, but I’ve done it. Thank you for your answer, I’m waiting for the hardware.. But more importantly : you have to be spending a lot of time behind the wheel ! The power bank does not recharge that fast while driving, and in my case the ratio driving vs. parked is insufficient to recharge it fully. I have finally tested the OBD port in my X90D, and I confirm that is is powered even when the car is locked or when you ask for a full power off from the main screen. My problem was coming from the OBD plug I purchased which was malfunctioning… I will get another one and still go with this solution. I’m just considering the new Thinkware F800 for our facelift Model S with AP1, European intrusion detection package and solid roof. I was hoping to find a professional installer in my country, but to no avail. I am really afraid to do it myself, but your article at least gave me a some hope. It would be great if you could go into even more details. Am I assuming right, that the mentioned mating connector – TE part 3-968696-2 is supposed to be put between the 4-pin plug and the intrusion detection module, for not having to use a Posi-Tap? Not sure about the third wire of the 3-wire hardware kit for the Thinkware. Is it hard to find that switched power connection in that area? I can not see myself trying to pull out that part of the headliner, and I’m not sure how the camera or mirror housing can be dismantled without damaging it. And then about getting in the wire from the front to the back for the rear camer. How is it possible to route the wire across the center of the headliner? It would be great if that part of the installation could be shown with more info and pictures. Great that you’re thinking ahead! For Europe, the TE connector will not work as it is occupied by the intrusion detector. I’d recommend going with posi-taps. The third switched power line on the Thinkware is a slight pain (they really should redesign it like the BlackVue). On the older Model S, there is a wire in the mirror that can be tapped. On cars with Auto-pilot, the same wire is in the area, but very difficult to get too. I’d recommend running a wire to the passenger side fuse block (LHD cars, not sure on RHD). You pull out the sill to access these fuses. I’m sure one fuse would have switched power, but I’ve not tested it out. I’ve been on some other projects and need to get back to a writeup on the rear wiring with pictures. Probably not until September. I hope I did understand that correctly, that for a BlackVue dash cam without the PowerMagic you only need to tap two wires that are easily accessible from the intrusion module plug, so no third wire for switched power, right? I’ve already given up on the Thinkware F800 again and will now be waiting for the successor of the BlackVue DR650S-2CH, which is known to be the DR750S-2CH and should become available shortly. Out of curiosity, was it harder to do the rear wiring than the front installation? Actually the Thinkware is the only dashcam I’m aware of that requires three wires. Most dashcams with two cameras power the rear from the front camera – so there is no additional power connection. You do have to run a wire from the front dashcam to the rear dashcam with the included cable. I’d say the rear is a bit more difficult as a proper installation needs to route the wire through the passenger side hatch flex tube. As a newbie to dash cams and their installation I may be confused, but isn’t the third wire for switched power used for parking detection? If the BlackVue and other dash cams with parking mode only require two wires (for permanent power), do they detect parking by motion sensor alone, and isn’t that less reliable? Parking mode is a very important feature for me, and I have been told that especially cheaper dash cams have a less than mediocre parking mode functionality. Hopefully that’s not connected to two versus three wires power supply. Isn’t it that Thinkware has the hardwiring electronics included in their dash cams, however BlackVue uses the external PowerMagic box. So with the Thinkware you can not bypass it, but you recommend not using the PowerMagic in a Tesla because it will cause problems. How comes and what problems does it cause? Other than the Thinkware, dashcams use video motion detection to decide if video should be retained. If the video doesn’t change, there is never a need to keep it (other than perhaps the first minute). If you’re parked, in most (but not all) the video is stationary and if there is motion (perhaps a thief) you want it recorded. If you are driving, there is clear motion and you’ll get a full recording. I’ve never understood the Thinkware design or why they force extra wiring – it’s the one area I dislike most about the Thinkware, an otherwise good choice. PowerMagic is only designed to power off the dashcam when the 12v battery gets low. It has nothing to do with parking/driving states. PowerMagic makes sense in an ICE car, but is awful for an EV which can last for months with the trivial power use of a dashcam. The Tesla 12v battery may go through 2-5 discharge/charge cycles in a day. When the 12v battery gets low, the Tesla recharges it from the main battery. When low the PowerMagic could disconnect the dashcam, so that you have multiple periods of zero coverage. Great information. I bought the TE part 3-968696-2 connector and pins for the front installation but haven’t picked the camera yet. I’ve put 20,000 trouble and care free miles in this amazing car, I think I’ve taken for granted the Farud Magnet these cars can be and hope I get the camera installed before it’s too late. I don’t see running wires all through the car and plan on just installing a second one in the back. I hope you’ll be finding the time to post the rear install info and pictures. Does it use the same 4 pin connector? I like the fact you don’t have to tap into wires to install a camera and by just using an existing plug they can’t claim any breach of the cars systems or warrantee. Tesla is finicky about everything only OEM and will jump at talking about voiding the warrantee. I don’t think it’s dire as they make it seem but they even freaked when I miunted unrecommended snow tires in the back. Thanks again, hope you post the rear install info soon. Still working on the rear dashcam documentation. A few other projects stacked up ahead of it! Really not much concern about warranty issues. I’ve made many modifications to my Tesla and never had any issues. I did dent an aluminum trim part while taking photos. It was my fault and later I had Tesla replace the trim at my cost. If you brake something, clearly it would not be covered under warranty. I have one of the last APv1 cars (delivered August 2016) and the 12v wire on the intrusion module is grey (other wires are green and black). If you are going with the A119, I would recommend 12v to 5v USB cord below. It’s considerably shorter than the one from WheelWitness so you have a lot less slack to deal with (and $5 cheaper). Good find! I’ll change it in the article. Any luck with the rear trunk side panel disassbly? “To get to the module, it is located on the passenger side, behind the trunk’s side panel. We are still preparing disassembly instructions and photos”. I’ve settled on the a119, to me resolution is everything. I’ve been waiting for the rain to abate and got on a few other projects meanwhile. I hope to get back to it next month. Sorry for the delay. I don’t know how old your car is, but it’s simple to check if you have the intrusion module connector or not. Just open up the microphone panel (pull down from back) and check if the 4-pin connector is taped down or attached to a module in the center. If you have the connector, installation is a snap (follow our instructions). I don’t know what hardware kit you’re looking at. The key to be sure it doesn’t have the low power down feature required for ICE cars. There is a link in this article for a hardware kit to convert 12v to 5v with the correct USB connector needed for the A119. It’s the one I used and it has been working fine. Apologies, I must have misread your statements above from the pictures, it appears the blackvue can’t see the license plate on the right side of the car but the 119 can. So, I assumed that the resolution just wasn’t enough on the blackvue to make it legible. Thanks again for the great article / comparison. Does the thinkware, have the same issue with not being able to show license plates? I’m not sure it’s fair to say 1080p cameras like the Thinkware F770 can’t read license plates. It just means they can’t read them if they too far away, while a higher resolution dashcam may be able to read it. A 720p dashcam would be even worse than a 1080p camera. For example, if you’re 5 feet directly behind a car all 1080p dashcams can capture video that should make plates readable. As the plate gets further away, it becomes too blurry to read. Sorry I don’t have an actual distance – I may try and test it out!